The cam originally used in all 428 CJ and SCJ engines was serviced using Ford part number C6OZ-6250-B. 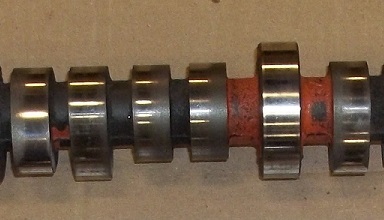 This is a hydraulic, flat-tappet cam with a 15-tooth distributor gear that was also used in 1966-1968 390 GT engines. The lifters originally specified for use with this cam when used in the 428 CJ engine were serviced using Ford part number C8AZ-6500-B. Sometime between 1970 and 1975 the C8AZ-6500-B lifter went obsolete and was replaced with a C8AZ-6500-A lifter. The 9.59" long standard-sized pushrods were serviced using Ford part number C8AZ-6565-A. An "as required" .030" oversized pushrod is available as service part number C4TZ-6565-B. There are typically no engineering numbers on this cam to identify it, but I have seen a reference that describes a ">" mark on this cam. Mark Haas has shared a picture of a NOS cam that has blue and green paint daubs, with the blue daub towards the front of the cam. Mark reports that there is a "U" above the yellow dot (at the rear facing) green daub that covers what is most likely a date code of 7K12. 180 degrees over from the green daub is a "K". Recent reports suggest that the service cam and the factory-installed cam were marked differently. 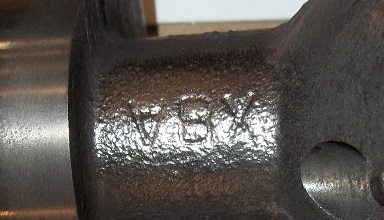 Observed factory-installed cams have been marked with orange paint daubs between the journals and lobes and "∀BX" at the back end. Thanks to Paul Rosina for these pictures. Ford also sold a "street and strip" cam for use in 428 CJ and SCJ engines that was serviced using Ford part number C8AX-6250-C. Ford described this cam as ".515 lift-steel-use on hydraulic lifter engines". Both the C6OZ-B and C8AX-C cams could be used with either non-adjustable rocker arms with a 1.73:1 ratio or adjustable rocker arms (from the 427 FE engine) with a 1.76:1 ratio. Going even further, Ford offered a "recommended for Super Stock Class" mechanical cam serviced using Ford part number C8AX-6250-D with more lift and longer duration. Ford described this cam as ".600 lift-steel-full race type-USE ON HIGH R.P.M. ENGINES - FOR STRIP OR TRACK ONLY - SPECIAL VALVE SPRINGS, SEATS & RETAINERS ARE REQUIRED". Valve Lift (1.73) 0.481" 0.490" 0.500" 0.500"
Lobe Lift (1.73) 0.278" 0.283" 0.289" 0.289"
Valve Lift (1.76) 0.487" 0.495" 0.509" 0.509"
A lot of people wonder if there is a modern replacement cam for the 428 CJ and SCJ. Lunati claims that their 10503 cam is "Lunati's version of the C6OZ-B 428 CJ & 360 horsepower camshaft". I'm interested in hearing what others have found from other cam vendors. "Crane & Lunati list their 'blueprint' cams for the 428CJ/390GT as having around 224°/232° @ .050", but the OEM cams really checked out around 209°-211°/219°-222°, depending on who was doing the measuring, and valve lift was more in the .475"/.486" range. One of the most similar cams to the OEM CJ model, is the Comp 265DEH...though it has numerous refinements and makes an excellent replacement." 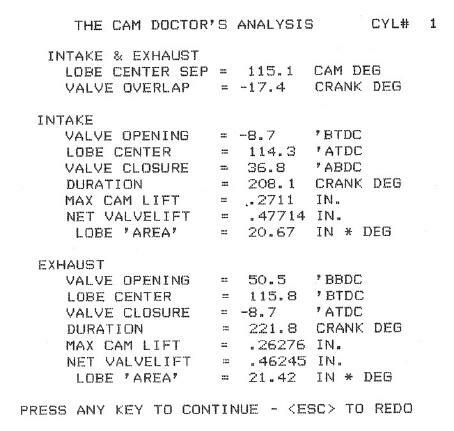 Compare the measured lift numbers with those listed in the table and you'll note that the Cam Doctor lift numbers indicate some lobe wear on both the intake (.2711 vs. .278) and exhaust (.26276 vs. .283) events. That's not unusual when measuring a used cam.